Tonight, in just about an hour, Governor Palin will speak to a sold-out room at the Women of Joy Conference in Louisville, Kentucky. Together – Women of Joy and you, for 3 days, 2 nights and 1 purpose – to glorify God in joyful praise! What happens when thousands of Christian women gather in one place? Amazing worship, the exposition of biblical Truth, strengthened relationships, encouraged spirits and deepened faith. Sarah Palin has drawn thousands of women to Freedom Hall in Louisville, for a Friday night speech at the start of a three day Christian women’s conference. “We came for Sarah Palin,” said Patricia Core of Springfield, Missouri. 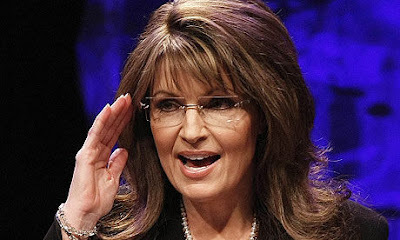 What does Core hope to hear in Palin’s speech? “I hope she says I’m running for President,” Core said, a thought echoed by many supporters standing in line to register for the conference. Read Arnold’s full article here. Core will not get her wish granted. Governor Palin will not announce a run for the presidency tonight, I’m sure. In fact, I imagine she will touch on politics, but politics likely will not dominate her speech. Nonetheless, while I don’t agree with calling the president a “duffus,” I certainly agree with the rest of Core’s words. The governor sparks such a strong reaction in people because she is a breath of fresh air, she is fearless in taking on the enemies of American greatness, and she is our best hope for getting this nation back on track with common sense conservatism and upstanding values. 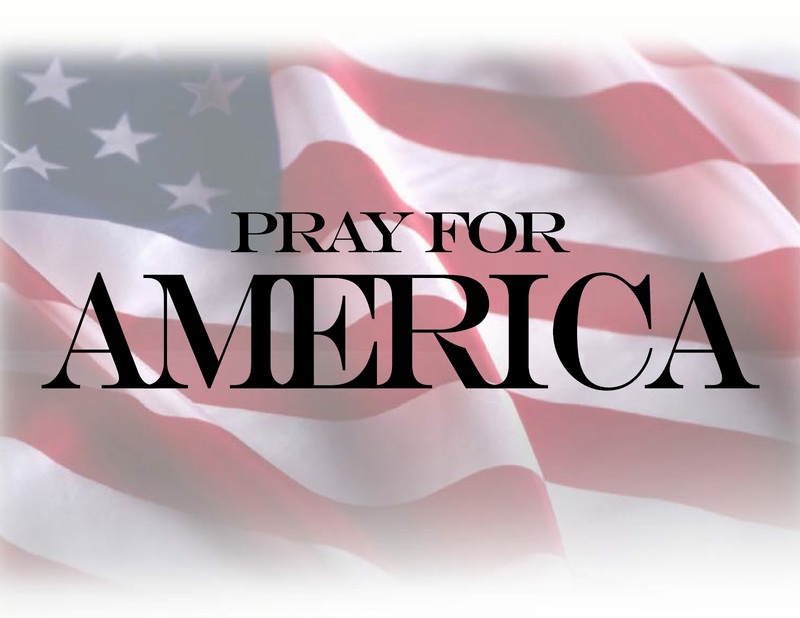 I pray tonight will be an uplifting and encouraging experience, not just for the registrants, but especially for Governor Palin. Update: Below is the Women of Joy TV spot. “I loved Sarah Palin from the first time I saw her on TV at the national convention. She thinks like I think – less government, less tax, more freedom,” he said, arriving three hours before the event to get a glimpse of Palin entering the banquet hall. “It’s hard to describe my admiration for her but I put her really high up there.” Not everyone was awestruck by the politician who appealed to Americans as the small-town hockey mom but has become a one-woman media empire since her failed bid for vice presidency. As people milled in the pre-dinner foyer sipping wine, Mary Burford said she wanted to make up her own mind about Palin. “She’s a personality,” said Burford of Hamilton. “She’s very influential and she’s very controversial.” Many seemed star-struck by Palin. “How often do figures like this come to Hamilton?” said Lecluse. Broderick, who now lives in Niagara Falls, Ont., but has dual citizenship, said she’d vote for Palin if she ran in the next U.S. presidential election. She said the Republican is treated unfairly in the media. HAMILTON – “Nothing is an accident just hold on, if you’re in a tough situation right now just hold on because you don’t know what’s just around the corner,” Palin, 46, told the crowd of 900 people who paid $200 each to hear her speech. Palin also appealed to the crowd by complimenting Hamilton on a number of occasions for the “hard work” of its residents in producing steel. She also said that she put in a good word with the NHL, saying Hamilton deserved its own hockey team. “They pick her apart for whatever reason,” she said, “for what she’s wearing. But she doesn’t let it get her down.” Steve Burns, 46, and his wife Shannon, 40, drove from Woodstock, Ont., for the event. Palin’s speech was to be followed by a question-and-answer session with Connie Smith, a veteran Hamilton personality and current host of a Christian television show. The event, billed “An Intimate Evening with Sarah Palin,” sold out shortly after it was first announced last November. Hamilton police Supt. Ken Bond said officers would be monitoring the event, but notably absent were any protesters. 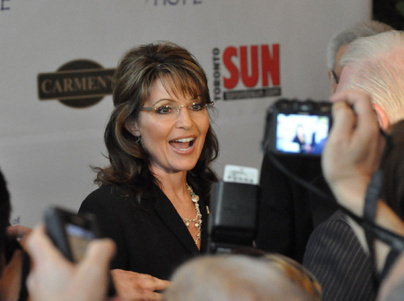 Michael Marini, a spokesman for the event said he and Palin discussed Canadian and American accents. “What struck me is the media image of Ms. Palin,” he said. “When you’re up and personal with her, she’s so humble and down to Earth.”Marini said Palin wowed him when she told him she knew Hamilton was a steel-producing city. Palin, 46, was expected to give a 20- to 30-minute speech on family values and community volunteerism, followed by a question-and-answer session with Connie Smith, a veteran Hamilton personality and current host of a Christian television show. The event, billed “An Intimate Evening with Sarah Palin,” sold out shortly after it was first announced last November. Security at the event is also under tight control by the organizers. Media are allowed to attend the formal dinner but are not allowed to bring in cameras or tape recorders. Journalists have been asked to dress in formal wear, with no blue jeans allowed. A portion of the proceeds from the event — originally slated to go to two area hospitals — will be donated to Charity of Hope, a Hamilton children’s organization that supports United Way, Kiwanis Boys and Girls clubs and the YMCA. The charity was named as a recipient following controversy surrounding Palin’s outspoken views on the Canadian health-care system. Sarah Palin Asks: Mr. President, Is A Strong America A Problem? This morning Sarah Palin has sent a second strong message to Barack Obama that he is on a dangerous path, a path that puts America and the free world in great peril. Mr. President, is a strong America a problem? Whether we like it or not? Most Americans do like it. America’s military may be one of the greatest forces for good the world has ever seen, liberating countless millions from tyranny, slavery, and oppression over the last 234 years. As a dominant superpower, the United States has won wars hot and cold; our military has advanced the cause of freedom in Iraq and Afghanistan and kept authoritarian powers like Russian and China in check. The president is looking to eliminate the last vestiges of the Reagan-era buildup. Once the wars in Iraq and Afghanistan are “ended” (not “won“), the arms control treaties signed, and defense budgets held at historic lows while social entitlements and debt service rise to near-European levels, the era of American superpower will have passed. The truth is this: by his actions we see a president who seems to be much more comfortable with an American military that isn’t quite so dominant and who feels the need to apologize for America when he travels overseas. Could it be a lack of faith in American exceptionalism? The fact is that America and our allies are safer when we are a dominant military superpower – whether President Obama likes it or not. As always, Sarah is spot on. A strong America means a safe world. Throughout our nation’s history, every time America has pulled back from the world stage, really bad things have happened. In fact, in the last century, two world wars could may have been averted had America projected her strengths instead of being isolationist. In more recent history, under another failed president, Jimmy Carter, we saw timidity coupled with ineptness on the world stage give birth to a renewed Islamic extremist movement which led directly to the terror attacks on September 11, 2001 that killed so many innocent Americans. Islamic extremists have killed untold numbers of innocent people world wide since the Carter years. Sadly, Obama is such an inept leader and radical ideologue, that we find ourselves actually wishing we had a President who was only as dangerously stupid as Jimmy Carter. Obama seeks a quiet world in order to focus his efforts on domestic reform—and to create conditions that would allow him to dismantle some of the national security state inherited from the Cold War and given new life and vigor after 9/11. Preferring disarmament agreements to military buildups and hoping to substitute regional balance-of-power arrangements for massive unilateral U.S. force commitments all over the globe, the president wishes ultimately for an orderly world in which burdens are shared and the military power of the United States is a less prominent feature on the international scene. Look, Obama and his party leaders are all radical Marxists. Many of the Obama regime’s top advisers are 1960’s rejects,… radicals who sought to bring America down and create some sort of communist utopia. Congress is full of these types as well. The way Obama and his radical regime looks at it is the way the Marxist-democrat party has looked at national security expenditures for a half century: Every dollars spent protecting America, every dollar spent defending our nation and our allies, is a dollar that cannot be spent on some insane social engineering project designed to transform American society into their vision of a Soviet style utopia. Radicals like Obama want a strong central command and control style of government that would shred the Constitution and take away all freedoms and liberty, exchanging them for a “benevolent dictatorship” that would control every function and facet of your life. To these radicals anything that stands in their way of creating this “benevolent dictatorship” must go. This includes the protection of America and her allies. Again, in the eyes of the Obama regime, a strong America, an America that is competitive world wide is not desirable. These radicals have a deeply embedded hatred for America and American exceptionalism. For decades Marxist-democrats have sought to end American exceptionalism, to apologize to the world for America’s greatness. In the eyes of these people, American’s greatness, our exceptionalism, is somehow unfair to the rest of the world. The kind of mental gymnastics one must go through to reach that conclusion are simply mind boggling. We agree with Sarah Palin’s way of thinking: A strong America is one of the greatest forces for good the world has ever known. America’s place as the world’s only Super Power is something we should be proud of, not apologize for. Military Power? Yes, we are! Whether we like it or not? Most Americans do like it. America’s military may be one of the greatest forces for good the world has ever seen, liberating countless millions from tyranny, slavery, and oppression over the last 234 years. As a dominant superpower, the United States has won wars hot and cold; our military has advanced the cause of freedom in Iraq and Afghanistan and kept authoritarian powers like Russia and China in check. Isn’t it interesting that the liberal media try to tell us that Sarah Palin is not fit to be president but yet they willingly drool all over Obama. Read Sarah Palin’s complete Facebook note here.